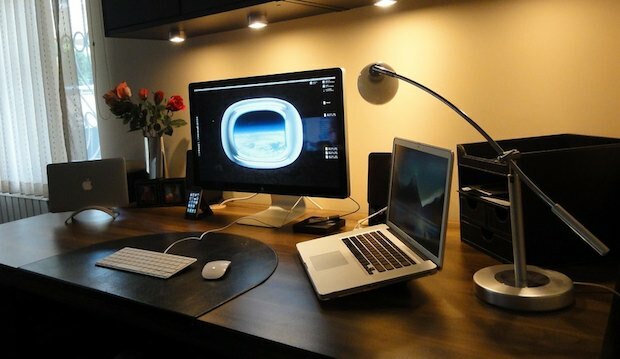 Here’s a nice Mac setup that features a MacBook Pro 15″ with a matte display connected to an Apple Cinema Display. To the left you’ll see an iPhone and a MacBook Air 11″ tucked into a BookArc stand. Personally, I’d have the MacBook Air open too and use the extra real estate while sharing the keyboard and mouse, you can do this with two apps; Teleport or Synergy. This is a really nice setup — I really like how he set up the table top with some flowers and such. The desk is of really nice quality too. I think that makes a big difference. And of course, the Cinema Display. Beautiful.